Largemouth bass love weeds. Successful anglers must learn how to target fish in the weeds. hanging up on my lure, I disliked removing the weeds from my hooks and I disliked the frustration caused by fishing in the weeds. In those days, I rarely fished for largemouth bass. In those days I didn’t understand the importance of weeds as part of a lake’s ecosystem. In those days I was unable to grasp the relationship between fish and weed cover. However, those days are gone. I look at weeds differently now. I still dislike removing weeds from my lures, but I also realize weeds are a key component in my overall bass fishing success. It was a day on the lake last summer that really got me to thinking about how important weed growth is to fish location. My fishing partner and I had not targeted this particular lake for bass for years. We knew finding a location pattern was the first order of business. It didn’t take long for us to get an idea about where to start. After a cruise around the shoreline, we discovered that one section of the lake had a well defined growth of coontail that came close to the surface. Coontail is a weed that will create quite a large canopy as it matures during the summer months. This canopy effect is very attractive to fish as it creates overhead cover and plenty of hiding places underneath where the weeds attach to the lake bottom. The clusters of coontail were so thick in places that it was impossible to effectively get a jig through the weeds to where the fish were hanging out. This problem was easy to resolve. Because the weeds were clearly visible, we were able to work the edges and pockets and avoid the perils associated with the thickest clumps. Although we did our best to avoid hanging up in weeds, it happened. I got to clean plenty of coontail off of my lures that day. However, we also discovered that the rewards were great as we boated some very impressive fish. Being able to visually target weeds is not that unusual. Anglers that fish lily pads or bulrushes know how important it can be to see the areas that have the greatest potential. The inside weed line is another edge I have come to appreciate as a visual fishing location. Bass love this edge where the weeds end and shoreline sand and rubble begin. It is a major travel route for bass especially early in the year. St. 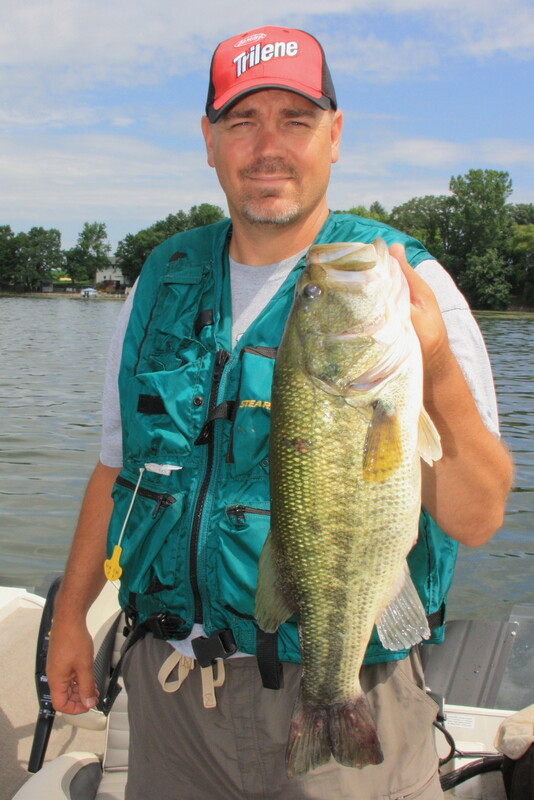 Cloud resident, Steve Taylor, with a weed oriented bass. When it comes to targeting bass that are relating to weeds, it is important to think about lures and equipment. 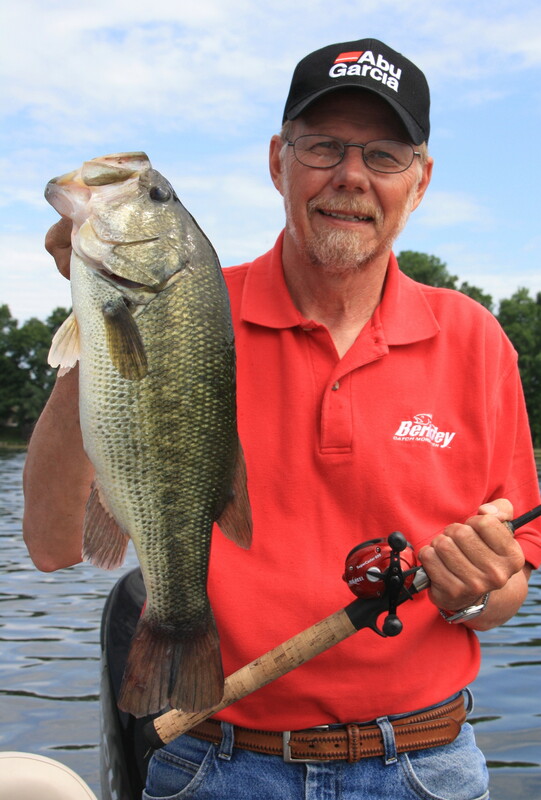 Without weedless baits, anglers can’t expect to catch anything but frustration. I am a big fan of Texas rigged Power Worms. This combination of weedlessness and scent continues to be one of my most consistent producers. Jigworms are also big on my list of favorites. Northland Tackle makes Weed Weasels and Jungle Jigs that feature an eye forward profile that slides effectively through cover. The baitkeeper design keeps your plastic trailer in place. Line is also a consideration. If you are going to fish heavy cover, make sure you have a line that is tough enough to pull fish out of the weed growth. I have seen a lot of anglers lose fish because their line and rod were not tough enough for the job. Weeds can definitely be a pain for anglers. However, for those that want to successfully target largemouth bass, being able to tolerate the headaches caused by weeds becomes well worth the trouble.